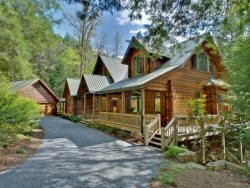 Find great pet-friendly cabins in Blue Ridge, GA with Georgia Mountain Cabin Rentals. Our huge selection of comfortable vacation homes gives you the largest selection to choose from! Complete with unique amenities and features each cabin has a character all its one. Closeby to pet-friendly hiking, parks, and swimming holes, Fido is sure to have a blast on vacation too! Be sure to ask us about our pet policies before booking.